Not all board game ideas make sense from the outside. The Mind is a coop game with no communication (except mind reading), Mao is a game where you don’t explain the rules, and Safranito is a dexterity economic game. What’s great about board games as a hobby is that games don’t always need to make sense in order to be good. 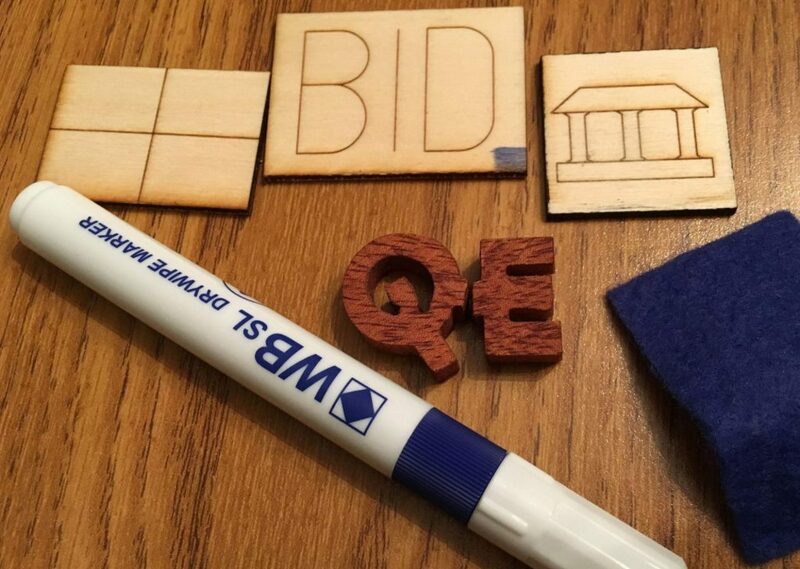 Q.E., or quantitative easing, is a fairly simple auction, set collection game with a twist – you have as much money as you want! Thematically, you’re a central bank trying to inject funds into your economy after a financial collapse. You have unlimited access to your printing press to bail out failing companies but if you print too much you may cause your economy to collapse. NOTE: all photos in this review are of the original edition of the game from Gavin Birnbaum and Cubiko games. More than likely your edition will not look like these photos. The gameplay is simple – there are sixteen companies that will be auctioned throughout the game. Each company is part of one of four industries, and is located in one of four countries. At the start of the game, each player is assigned a country and one company. Each round of the game, the active player flips up the next company tile and decides on an opening bid. Then, every other player makes a secret bid. Whomever bids the highest wins the company and the auctioneer gives them the company tile with the amount of money they bid on the back, but doesn’t tell anyone else what the bid is. This process continues until all sixteen companies have been auctioned. 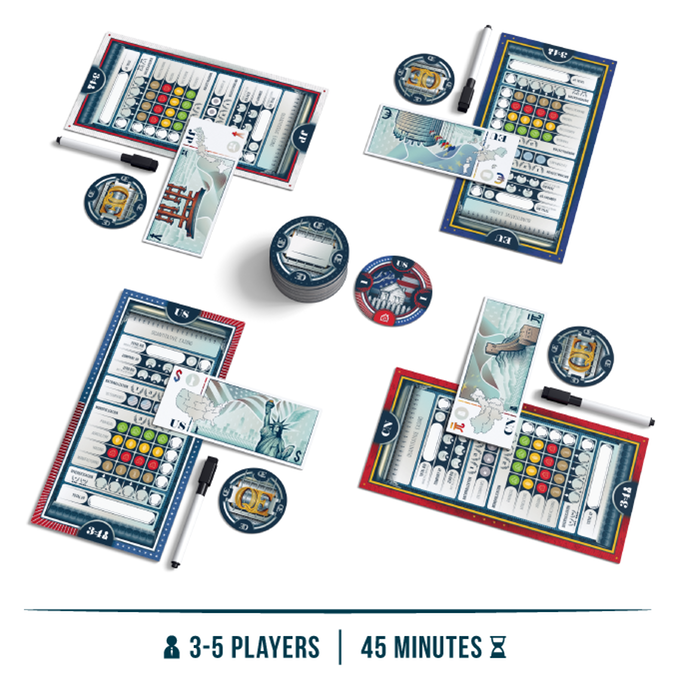 At the end of the game, players score points for four categories. First, there are points on the company tiles that were auctioned off. Second, they score points for companies with the same flag as their flag (Nationalization). Third, they score points how many companies of each type they’ve won (Monopolization). Fourth, they score points for having 3 or 4 different types of companies (Diversification). But Q.E. has a catch. The player who bid the most money in winning bids automatically loses the game. The player with the most points is the winner. 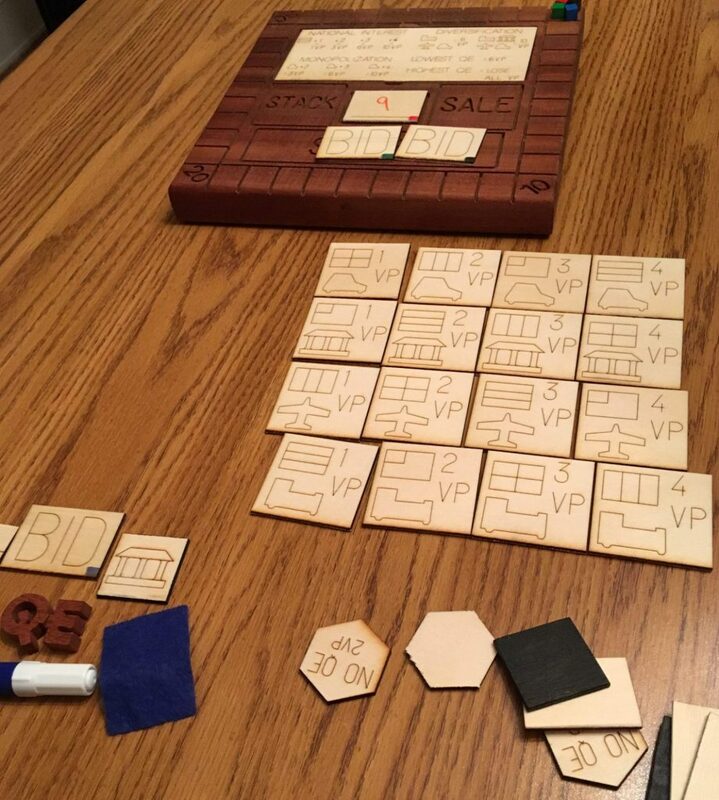 All of the photos of the wooden version of the game are from one of the original edition of the game. At the release of this article, Q.E. is on kickstarter (for the third time technically) for an edition of the game that looks very different. The kickstarter edition includes rules and pieces for the 3 player variant and the 5 player expansion. 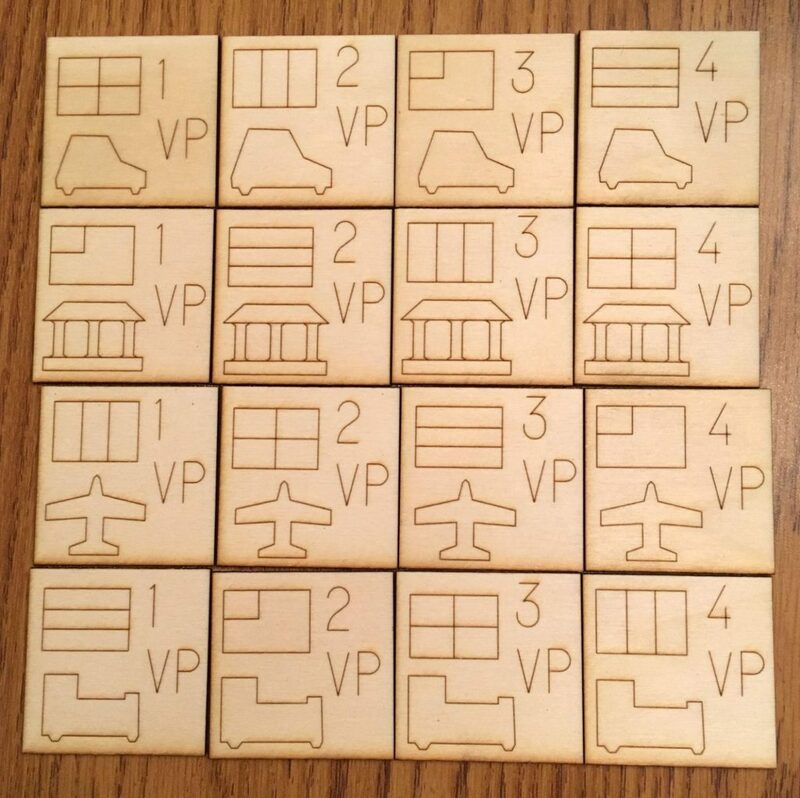 The wooden edition technically has had the 5 player expansion made for it, but the publisher has only made a few copies. The gameplay is identical no matter what edition you have, but the components are very different. Q.E. is an incredibly unique game. An auction game with no money, but the person spending the most money loses? That simple twist creates an incredible amount of tension within the meta of the game experience. In most of my games, players have spent around 10-20 dollars on the high range for bids, but in other games players have spent hundreds or thousands. The gameplay may seem like it is player elimination, but it never feels like it. Since you can’t track all of the bids other players are making, you can’t fully know how much has been spent and as a result where you stand. I’ve had several games where I was convinced I had spent the most, but I learned someone else made higher bids and I was still in it. In other games, I thought I was playing the meta well, but at the end I found I was overbidding. The biggest problem I have with the game is the player count. In the original edition of the game the game was designed for exactly four players with variant rules for three. I felt like the three player rules didn’t capture the experience well enough and the game needs to be played at four. Gavin Birnbaum has created a few copies of the five player expansion, but I haven’t been able to get my hands on one yet. Q.E. is a great filler game. The gameplay is tight and plays in about 30-45 minutes. Every decision you make and how you interact with the players around you is entirely derived from the people around the table and I love games like that. The whole premise of printing as much money as you want is entirely a gimmick, but it really works in this game because of the player elimination at the end and it never feel gimmicky. Since you don’t know how much players are bidding, outside of the tiles you have won and auctioned off, the tension building from the threat of overbidding makes your choices tough. If you like auction games and you have a consistent group of four, I’d highly recommend picking up a copy of Q.E. Previous postBandido Review – It’s a Game About Tunnels, Ya Dig?